Young Australian men joined forces and fought for Peace at a time when evil deeds were tools of power. War Stories surface from the battles and are told by the tired ones that survived. Both World Wars brought many refugees who fled Europe to build a life for future generations in Australia. Rosa was born in Poland, she was 13 years of age when World War 2, broke out on September 1939. Her young life would be thrown into a horror that she would have to endure. What is most remarkable about Rosa’s account of what happened to her and her family was her unrelenting bravery. Her father had a shop that sold leather goods such as purses, shoes and bags; it was a successful business that provided a comfortable life for Rosa and her family. The war encroached upon them bit by bit, schools were closed and then the shops were off limits to them because they were Jewish. They had to leave their home, possessions and business and move into a ghetto. Rosa’s 17-year-old sister decided to go to Russia where she could continue her studies in design, or find work. Many Jewish people thought they would be safer in Russia. Meanwhile Rosa’s remaining family that included an older brother and a baby were resettled on a cold and raining day. In the morning was a ‘Selection’. “We were lucky as we were all selected to go on one side, I don’t know which one was the good one, right or left? But we were allowed to go home. That day I lost my grandparents, aunties and uncles.” Rosa explains. Many of Rosa’s extended family were sent to the death camps in the town of Auschwitz, they were ignorant of their fate and thought that the re-location was into the township. Life was very dangerous. A near by Synagogue was burnt with men within it and Rosa remembered the dreadful smell. Her older brother was sent to a work camp. One day he came home with a self- inflicted wound, a friend at the camp had advised him to cut himself so that he could get some leave. It worked but overnight the wound got infected. It was curfew but the mother risked going out and pleaded with a German soldier to send for a doctor. His life was saved as the doctor came and gave him the medication he needed to recover. Food was scarce and Rosa stood in bread lines from 5am in the morning, but it made no difference as she was denied her share, due to her ethnic background. Her father resorted to the Black Market. Most things were available on the Black Market so her father decided to sell his leather goods on it, to generate an income. A Jewish man in their neighbourhood was collaborating with the Germans and he found out about the side business. Every Thursday Germans would search Rosa’s home and even though they could not find any evidence they arrested her father. Rosa’s mother paid a ransom to the traitor every week to free her husband and keep him out of jail. The ‘traitor’ that had been collecting money from Rosa’s family saw that she was on the list to the death camp. He decided to help her due to the payments he had received. “He could say who was going to live and who was going to die”. Rosa explains. “Your too young to die” The Traitor told her. She was saved from the death camp and ended up at a work camp where she was told that she would be making parts for bicycles. She was then told to give up all of her meagre possessions such as watches, photos and jewellery. As her greatest possession were two photographs (that she still has) she hid them behind a brick in the wall. They no longer called her by name but rather by a number, which she resented. When she was working at the factory she went into a back office looking for an officer. She went into the vacated room and read the German signage on the wall and realised that they weren’t making bicycles. They were making bombs. No! I wont do it. Rosa explained her thoughts. When she was discovered in the forbidden office, she pretended that she couldn’t read German. Secretly she asked God to forgive her lie. When she was returned to the factory she informed her friend of her discovery. “ I made them not to measurement, I made them bigger, they were good for nothing. My boss, he noticed and asked me to concentrate more, he was German so I couldn’t tell him. I broke the needles, I made them bigger and everyday he said, what you are doing is wrong. One day more men came and stood behind my back and watched me working. I break more needles; I make them bigger. They told me to stand up and sent me to a German woman, she was not very nice and she told me that I was to go to Auschwitz.” Rosa recalled. That was three months before the war had ended. Everyday Rosa reported to her and everyday she was told that she would go the following day. They couldn’t send her because the Liberation had begun; it was 1945. Suddenly there was no work for the girls and the factory seized operations. Men with guns surrounded the camp and called for the girls to come out but they were too frightened to do so. They yelled out to them that they were free but Rosa and her friends didn’t believe them until from a window, she saw her cousin in the crowd. “Its not a joke anymore, we are free’ Rosa declared to the girls. “We laughed, we cried, we kissed. The first thing I did was go a get the pictures,” Rosa explained. 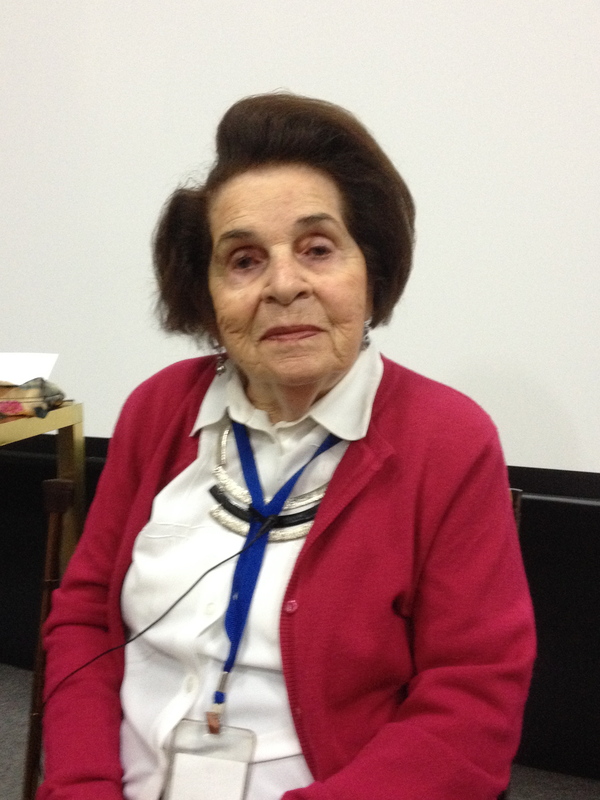 Rosa came to Australia in 1960 with her husband and two children. They settled and made a new home. She is happy here and thinks that it is a beautiful country. “ I have seven great grandsons. Hitler didn’t survive long enough to kill me too.” Rosa states. (Rosa’s older brother and sister survived but her parents and baby sister did not).